A few weeks ago I posted a photo of one of my Easter tables from years past on Instagram, saying that I hadn't come up with a plan for this year's table yet. One of my followers said that she'd like to see my take on pastels. My first thought was "I don't do pastels", but the thought stuck in my mind. So, although there is still some punchy color, I guess this is as close as I get to doing pastels! I browsed the Dollar Spot at Target last week and found a pack of hot pink honeycomb balls (in the $3 section). My sister reminded me that she still had some left from her wedding, and inspiration struck for this year's table. 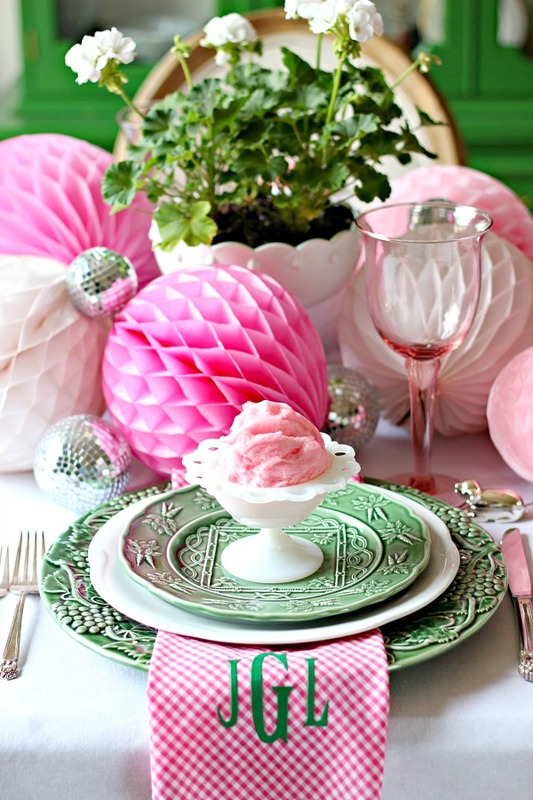 I've been a fan of paper party decorations for Christmas (see here and here), so I thought it would be fun to use them in a tablescape too. My DIY candelabra anchors the center of the table, and I used the honeycomb balls as a makeshift runner. I couldn't resist adding a few mirrored balls in there, too, for a bit of sparkle. I had planned to use some cute green straw bunnies that I've had for years in the center of each place setting, but when I dug them out some were missing and they were not in great shape. So, I improvised and pulled out a small tub of cotton candy that I was going to give to the kids on Easter (oops) and split it up into small bowls. You can't leave cotton candy out for long, though, or it starts to disintegrate and get hard. #lessonlearned Oh well, my son actually likes it best that way and didn't have any trouble polishing off a bowl full after I finished with the photos. Lowe's has the small pint containers of geraniums for $1 each this week, so I picked up several and used 4 in each milk glass container flanking the candelabra rather than cut flowers. After Easter I can add them to some of my outdoor pots. I picked up some gingham fabric from Hobby Lobby and made my napkins, finishing them off with my monogram. The pie is ready in the freezer, the table is set, and we're ready for a house full of family on Sunday! And even though our day will be full of church and family and fun and games, I pray our hearts are prepared to celebrate the true meaning of the day... JESUS IS RISEN, and He knows YOU and loves YOU!! If you don't have the privilege of having a personal relationship with Him, I'd love to share more about that with you! 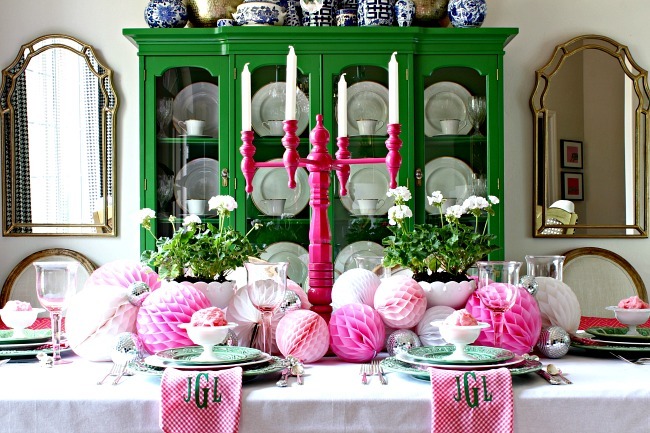 And plenty of Easter tables from the past! your tables are always so much fun! and that pie- yum! Thanks Cassie, Emmy would love making that pie. She could do it in a flash! Thank you for sharing the pretties as well as the true meaning of the day! 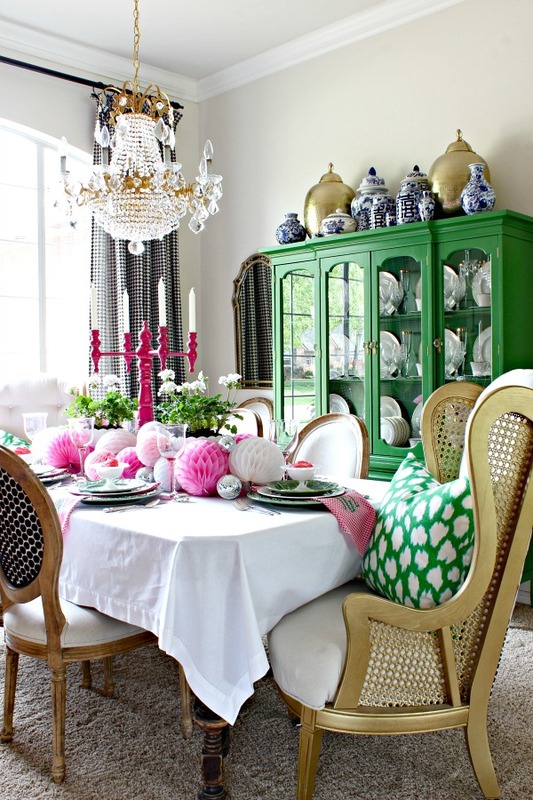 LOVE the pink and green - one of my favorite color combos! Those napkins are amazing! Thanks for sharing the shop - I've always wondered how you did the monogram. Ray bought me that machine out of the blue, and it's been the best investment ever! I'm sure it's paid for itself with all of the monograms I've done, for myself and for gifts! 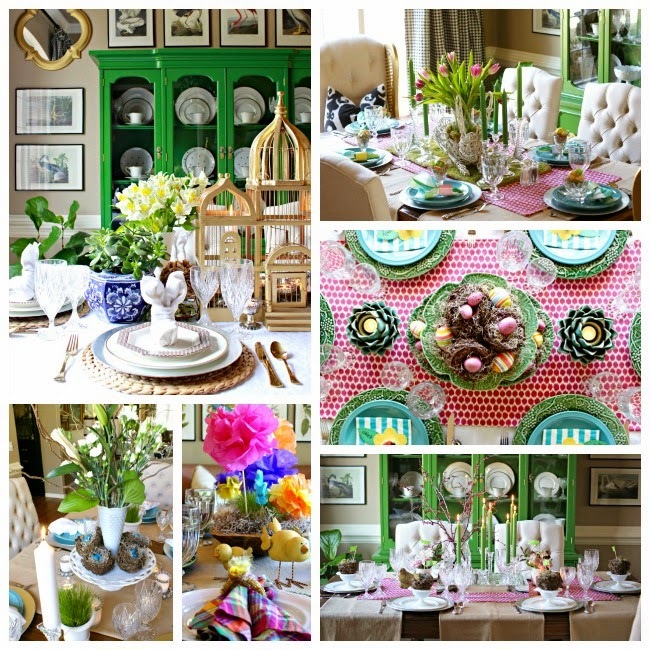 Thanks for sharing your Easter table- it's beautiful! I love your take on pastels..I may love color as much as you and pastels typically don't do it for me. But I must admit I focused in on your monogramed napkins! My sweet husband bought me the same machine as yours as a Christmas present two years ago!! I took one lesson..came home to try it on my own and broke several needles, after spending hours figuring out how to download fonts I liked! :/ It's not as easy as people think! You are talented and patient...thanks again for sharing! Maybe I'll give that machine another try! Did you have to reposition for each letter? Or did the machine do all three letters at once? If you search "SE 400" on that you tube channel there are lots of good videos. He is risen indeed! Have a blessed Easter Jennifer! I follow you on instagram as well as on your blog. You are amazingly talented but always seem to have your focus on God first and family and church second. I love that! Your ideas are do-able and not overly expensive. I like that too. And just as Jeannie mentioned, I'd like to know more about monogramming. I have your machine too. But I know I'll need some help getting started with monogramming. Is there a you tube video that might be helpful? Thanks so much! Thanks girls!! Linda, for helping me feel like I'm not alone :) And Jennifer for hearing us!! Happy Easter! 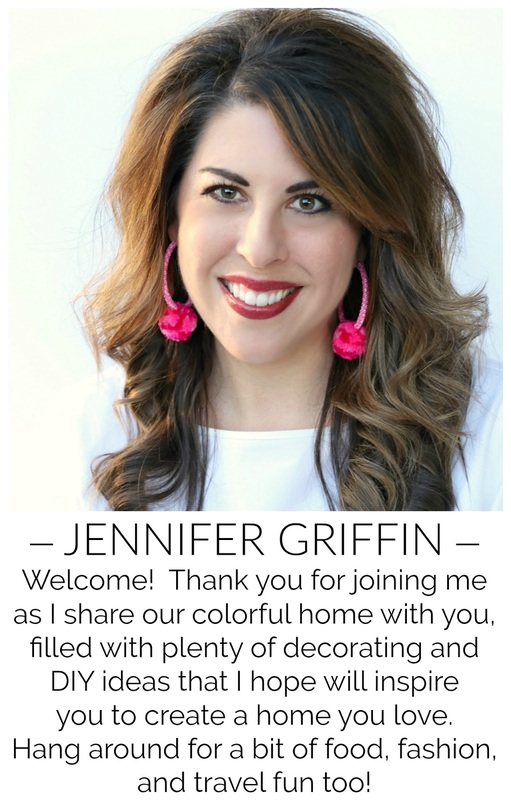 And Jennifer, thanks so much! A post sounds great! 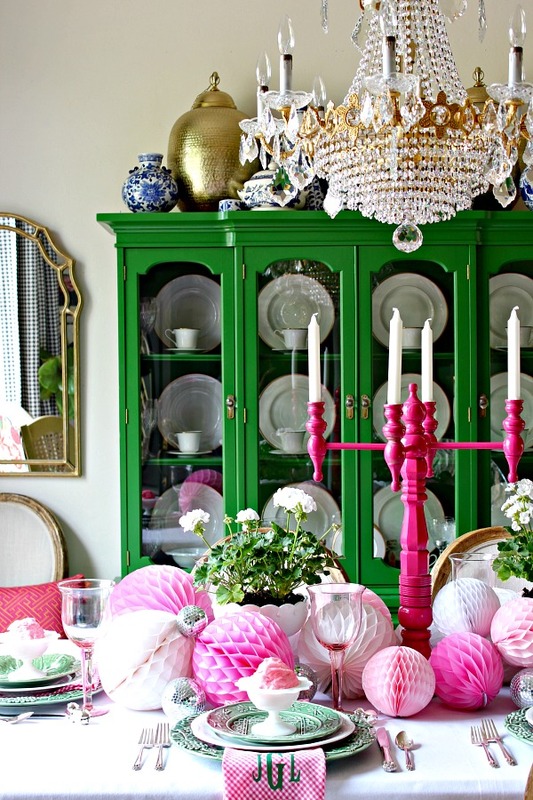 Your dining room is gorgeous, and all your table settings so glorliously colorful! 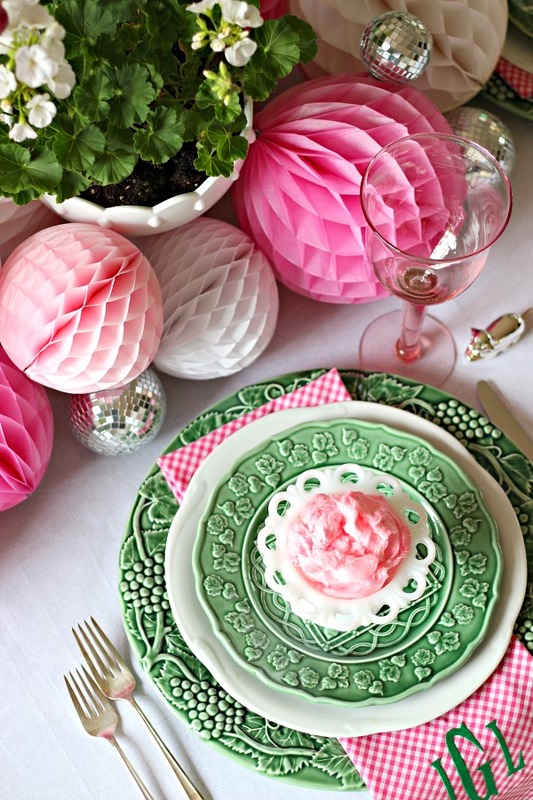 Your use of the potted geraniums in the milk glass is a great idea. 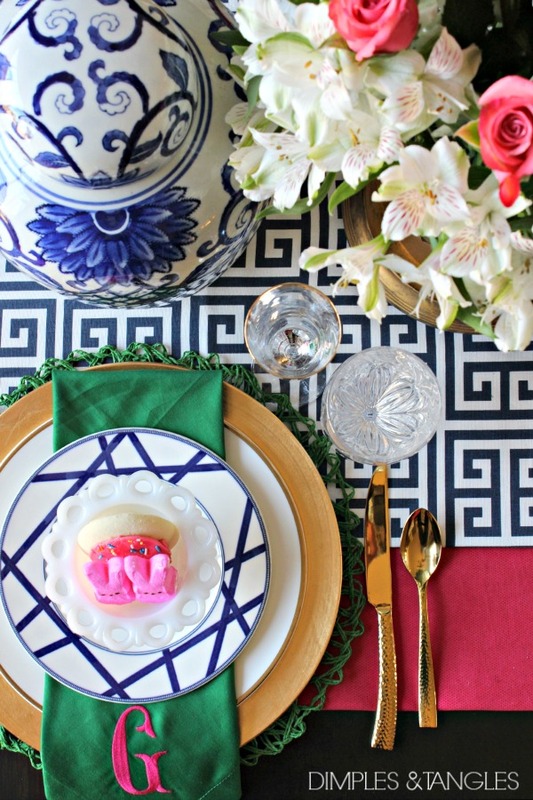 Beautiful tablescape, Jennifer! 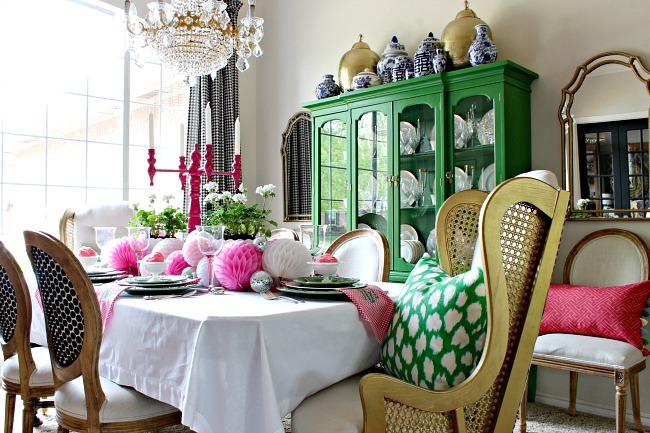 Your dining room is my favorite of all I have seen on blogs...your sense of color is awesome. 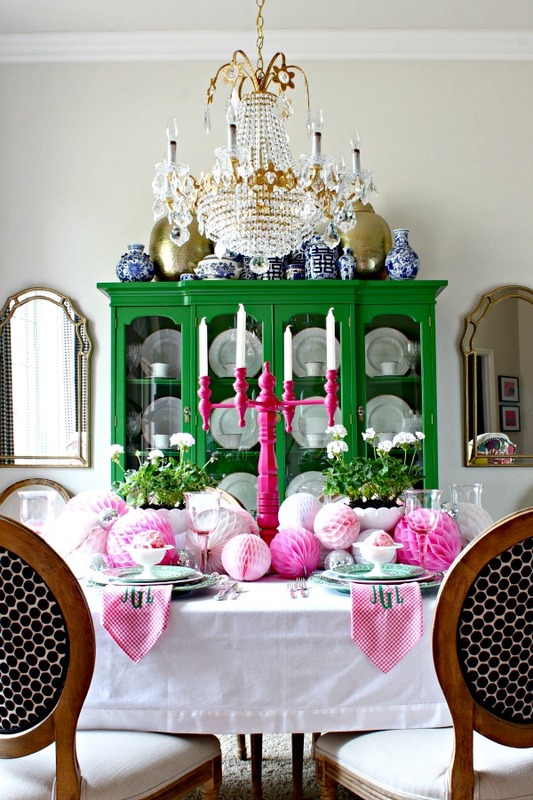 Love the pink and green! After seeing your recipe for the Pink Lemonade Pie I bought the ingredients - I've got 2 in the freezer! Thanks! Yes, Easter is really not about the eggs, bunnies and candy. It's fun for little ones and I love watching them in Easter egg hunts! We are so very blessed that Jesus has risen! His love for us is always amazing, IMHO. I would love information re: the monogramming! I'm having back surgery on the 24th and it's going to be a lengthy recovery period. When I'm able, I can watch the videos, read your hints and feel that I have learned a lot! Your table is so BEAUTIFUL!! Awesome!! 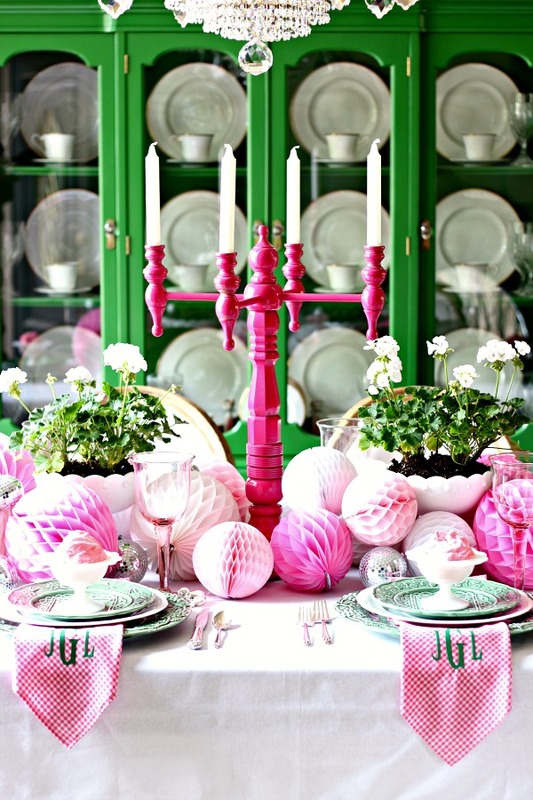 I love your pink and green Easter table. It certainly pops! 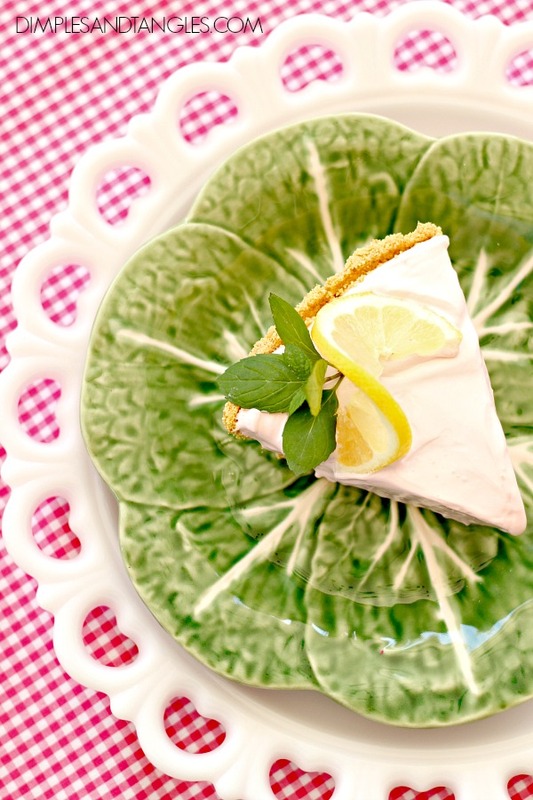 And I've just finished my Pink Lemonade Pie and loaded into the freezer. Super easy-peazy! Thank you again for the recipe. Happy Easter to all. He is risen!! 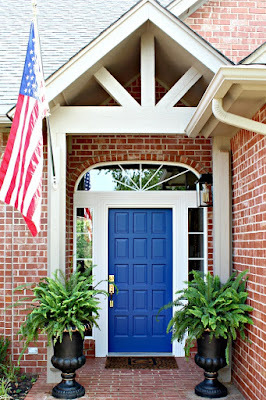 Another amazing display, two of my all time favorite color combos! You never, ever disappoint, with the beautiful mixes of bright colors. 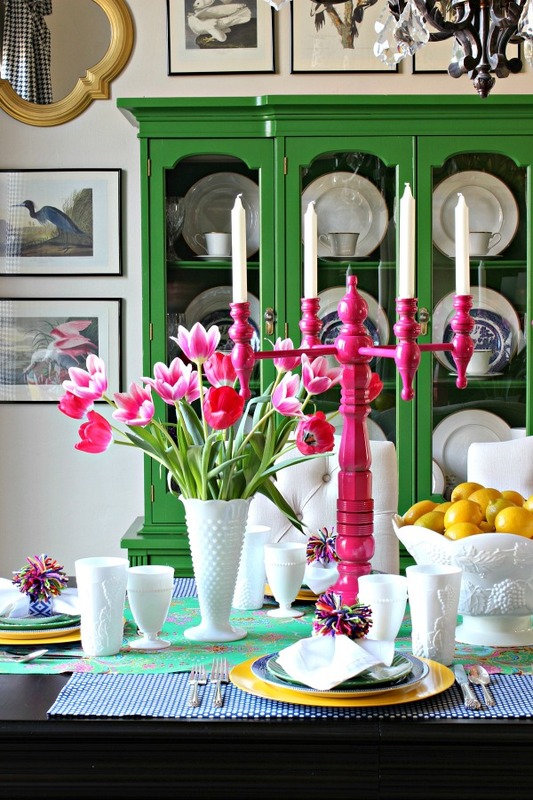 So refreshing to see someone who is not afraid to combine such classics as black and white check, and bright green and pink. Not a fan of today's whitewashed, faded look...the world is a brighter place than that, and I love seeing how you use your God given talents, while all the while thanking and acknowledging him. Keep up the good work, and may you and yours have a very blessed Easter! Oh, and can't wait to try that pie, omgoodness, does that ever look delicious, can understand why it's your hubs favorite!! Jennifer I love that idea of using the honeycomb balls en masse! You have my wheels turning for our upcoming graduation party. 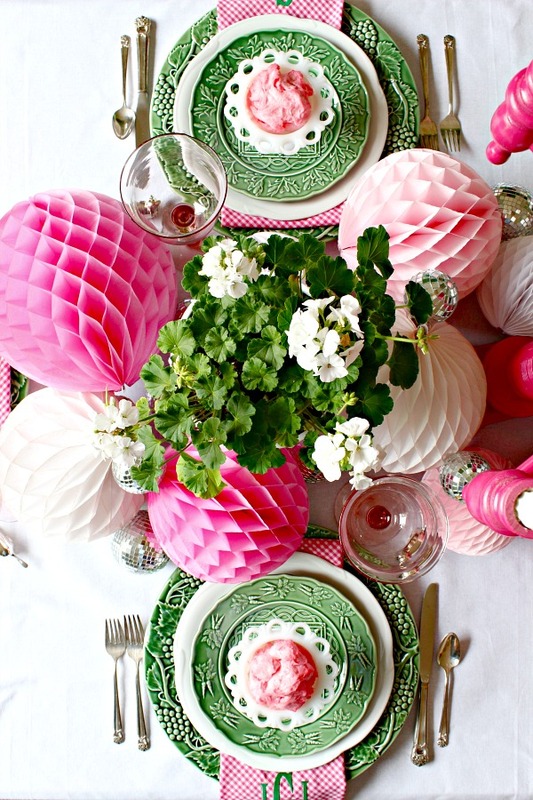 Such a fun idea for Easter. Hope you and your family had a wonderful day yesterday.